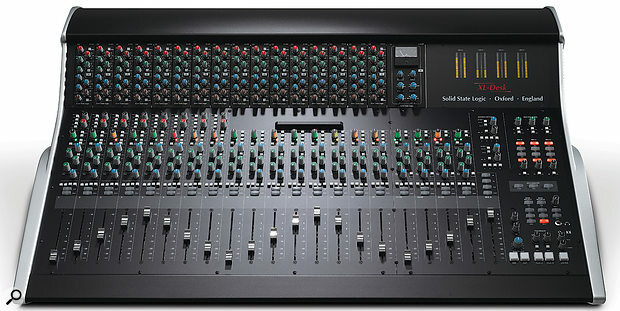 The XL-Desk is the first Solid State Logic mixer that can host hardware processors in the ubiquitous 500-series format. SSL describe their new XL–Desk as the “smart dumb analogue console” and that sums it up pretty well, because although it’s a traditional old–school console in many ways, it’s also the result of some very smart design. There are two common trends in analogue console design at the moment: the integration of increasingly comprehensive DAW–control and automation facilities, and the inclusion of API 500–series slots, to allow the user’s choice of preamps and processors to be incorporated into the console. For now, at least (I detected hints of future possibilities), the XL–Desk ignores the world of DAW control and automation. Instead, the design team’s focus has been on creating SSL’s first console to cater for the 500 series. Sixteen module slots are placed in–line with the console channels, and there are two more which, by default, house the most recent version of the company’s G–series stereo bus compressor (which now boasts a high–pass filter in the side–chain). The XL–Desk may be purchased with all 500–series slots empty, or with all 16 slots pre–loaded with SSL’s E–series EQ modules. That said, as the EQ modules are available separately, it should be a trivial matter to configure a version with, say, eight EQ modules.The XL–Desk may be purchased with all 500–series slots empty, or with eight or all 16 slots pre–loaded with SSL’s E–series EQ modules. SSL’s VHD mic preamps (of which more later) are built in to the first eight of the 16 mono input channels, but any 500–series mic preamps can be plumbed and patched in. If you really wanted to, you could fill all 16 slots with preamps, patching the last eight into the four stereo line inputs, giving you a possible total of 24 mic preamps for tracking, with all preamps hosted in and powered by the console. In essence, the XL–Desk is a generously expanded version of SSL’s X–Desk (http://sosm.ag/ssl-xdesk), but with scope for yet more expansion. In a way, the XL-Desk is aimed at a similar market to that catered for by API’s The Box (http://sosm.ag/api-thebox): the sort of smaller professional studio that’s becoming increasingly common these days. While that device has plenty to commend it, including the signature API sound, the XL-Desk offers its own sonic signature — and far greater versatility. You might think of it as a big summing box that includes a versatile ‘big console’ front end and monitoring section, with a wealth of analogue patching opportunities. Many will probably reject this console simply because it lacks DAW control and automation, but this won’t trouble SSL, as they have those areas well catered for at a range of prices, in the form of the Nucleus, Sigma, Matrix 2, AWS and Duality consoles. Instead, the XL-Desk is intended for those who want relatively modest tracking functionality and expansive analogue summing (using their DAW’s level automation) but who require more versatility and channels than offered by the X–Desk. The circuitry uses exactly the same SuperAnalogue technology that’s employed in all current SSL analogue consoles and much of their outboard, and so it shares the same ultra–clean family sonic signature. And for anyone who’s really desperate to automate this desk, it’s perfectly feasible to hook up SSL’s Sigma remote–controlled summing box (http://sosm.ag/ssl-sigma). A free–standing console, the XL–Desk is intended to sit on a (sturdy) table top. It measures 1015mm (40 inches) wide by 812mm (32 inches) deep, with a maximum height of 251mm (10 inches), and it’s quite a heavy beast — 41kg, but twice that when boxed up. It’s definitely a two–person lift! Two internal 200W universal power supplies (one for the console, one for the 500–series rack) are fed from a single IEC inlet, accepting 100V–240V AC and consuming under 300W. The 500–series rack’s supply is generously over–specified, to guarantee compatibility with even the most current–hungry third–party modules. Three quiet fans at the back of the console draw air in through slots under the front arm–rest, and expel it from the top of the rear panel. One fan is for the power supplies, while the other two cool the console electronics and 500–series slots. I suppose the fans might become audible in a really quiet room, but they’re certainly much quieter than a typical Mac Pro’s fan, and definitely quieter than the air conditioning in SSL’s demo room! (I only became aware of low–level fan noise when I crouched down behind the desk to examine the connectivity.) The fans do their job well: the power supply heatsink was barely warm to the touch after several hours’ use, and the control surface remained reassuringly cool throughout. Virtually all audio connectivity is via 25–pin D–subs (27 of them in total), all wired to the ubiquitous AES59 (Tascam) standard. The only exceptions are a pair of XLRs, which duplicate the main monitor outputs, and a third XLR to accept an external studio ‘Listen Mic’ input (for which phantom power is selectable via a DIP switch on the rear panel). The reason for so many D–subs is that the mono channels all have dual inputs, everything has a direct output, and there are no fewer than 40 balanced insert points! In addition, each 500–series slot has its own independent I/O connections. On the rear are a USB port for ‘console diagnostics’ and two unused D–subs mysteriously labelled ‘AJ’ and ‘CJ’. These cryptic letters are the initials of the console’s designers, Andy Jackson and Chris Jenkins, and the handbook only refers to them as being “a secret”, although the block diagram shows external bus access for future channel expansion options, which would occupy at least one of these sockets. Clearly, SSL have planned for some level of future development. Twenty-four input channels are spread across 20 channel strips (16 mono and four stereo). Each input channel is equipped with two mono aux and one stereo cue sends, just as on the X–Desk, but there’s no dedicated channel EQ or other processing; that’s what the 500–series rack slots are for. However, in typical SSL fashion, the XL–Desk is much ‘bigger’ than it looks: the dual–input topology allows a nominal 44 inputs for mixdown, and there are ways to bring more inputs than that into play (see below). Input channels can be routed to the main stereo mix bus (A) as usual, but there are also three more stereo sub–buses (B, C and D) which can be used to create discrete stems for separate section processing before being mixed back into the main A bus, or recorded back into the DAW. The standard mono channel strip: the first eight of these include the VHD preamp at the top, and all have a 500–series slot positioned above.The 16 mono input channels are provided with a ±20dB input level trim control, and an adjacent multi–colour LED indicates the signal level. The levels at which the colour changes varies, depending on whether the console’s meters are configured for maximum levels of +24dBu (standard) or +18dBu (European broadcast), but they’re always green below –24dBu, yellow above the nominal operating level, and red when within -2dB of the selected peak level. Cleverly, the light from these LEDs reflects off the corresponding trim knobs, improving their visibility considerably. Push–buttons select each channel’s input source (main input or DAW return), as well as inverting polarity and enabling two separate balanced insert–points. The first insert loop is intended to access the 500–series rack slot directly above the corresponding channel strip, while the second allows other subsequent outboard processing. Both these inserts, as well as the corresponding 500–series inputs and outputs, are provided on separate D–subs on the console’s rear panel, and considerable patching flexibility is afforded if they’re wired to an external patchbay (the manual details a suitable half–normalled layout). The ‘main input’ for the first eight mono channels comes, as mentioned, from built–in VHD mic preamps (as employed in SSL’s Duality, X–Rack modules, and the Alpha VHD rack preamp), while channels 9–16 have balanced line inputs. VHD is an acronym for ‘Variable Harmonic Drive’, which generates predominantly second- or third-harmonic (valve-like or transistor-like) distortion, to add some sonic character. The amount of distortion is determined largely by the gain setting, hence the need for a channel trim control post–preamp to tame the peak levels! Usefully, the VHD processing can also be switched out, to provide a clean 9000–console–style SuperAnalogue preamp, if preferred. Naturally, the VHD preamps can accommodate line inputs, too, making them useful for adding character to line sources such as synths. Between +15 and +75 dB of gain is available from the preamps, and other buttons in the preamp section select a 20dB pad, 48V phantom power, and a ‘Hi–Z’ option. The last is not quite what you might think, though. It raises the input impedance from 1.2kΩ to 10kΩ, which is great for ribbon mics and line–level sources but not appropriate for electric guitars and other instruments, which typically require an input impedance of between 250kΩ and 1MΩ. Some potential customers might question the inclusion of eight built–in preamps, arguing either that they’d rather use external or 500–series preamps, or that they’d prefer a preamp on each and every channel. However, some degree of pragmatic compromise is needed to deliver a certain level of flexibility at a target cost, and I think SSL have got it about right. Importantly, the inclusion of the preamps means that the fully loaded version, with EQs on every channel, is ready to use for both tracking and mixing right out of the box. The eight built–in VHD preamps are sufficient to make it completely hassle–free to track modest setups, including a drum kit, in a typical project studio. And for anyone wanting a different configuration, the impressively versatile connectivity makes it very easy to hook up external mic preamps, when needed, and to bypass the internal preamps completely. 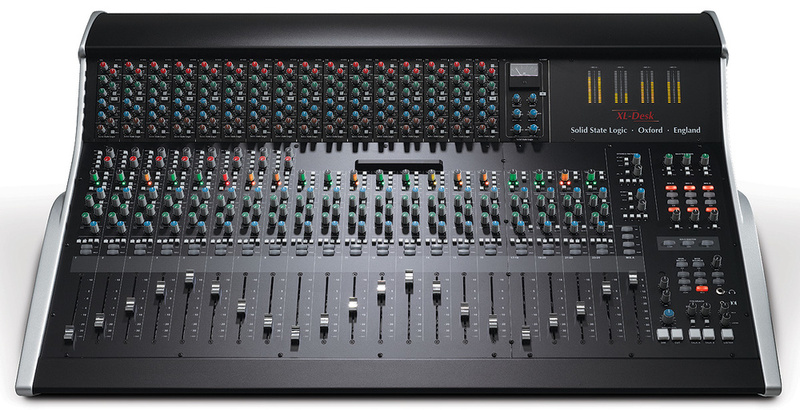 SSL’s 611 500–series EQ: the console can be bought with or without these installed in the 500–series channel slots.The remaining channel facilities are much the same as those of the X–Desk, with the two mono aux sends and a stereo cue, as already mentioned. The latter can be switched pre/post-fader on individual channels, while the mono aux sends default to post–fader, with global pre–fader switching via buttons in the aux master section. Usefully, the stereo cue signal can be derived either from the channel’s main signal or from the second (DAW) input — so if the channel path is currently using the main input, the Alt Cue option selects the DAW return (and vice versa). Not only does this increase the versatility of the cue send system, it also provides additional inputs for mixdown, because the cue bus output can be routed back into the main A mix bus via a button in the master section. Each channel’s panned output can be routed to any (or all) of the four stereo mix buses, and large illuminated solo and cut lozenge buttons are provided above the 100mm fader’s scribble-strip space. The solo button can be configured in the master section to operate either as a destructive solo–in–place (muting the other channels), or in a ‘mix–safe’ stereo AFL (after–fader listen) mode. An elegant solo–safe facility is provided to isolate specific channels from being muted when a solo is activated, and there’s also a solo–clear button. These are nice, big–console features! The four additional stereo input channels are not as flexible as the mono channels, as they don’t have alternative inputs and, more importantly, they don’t have inserts or 500–series slot options. (Although you can use 500–series modules as the input source if you wish, there are no dedicated 500–series facilities in the channels themselves.) However, the ±20dB input trim control is retained, and separate left and right polarity–inversion buttons are provided. There’s also a mono button, a pan/balance control, and the same ABCD stereo bus routing, solo, cut and fader facilities, as well as the two auxes and the stereo cue send. Every mono and stereo input channel, as well as the two stereo effects returns and the four stereo mix buses, has a balanced direct output, with independent pre/post-fader switching for the mono and stereo channel direct outputs. There’s even a direct output from the Listen Mic compressor! The idea of all these direct outputs is so that all channel signals and mix stems can be recorded directly into the DAW when tracking, or when building and archiving mixes. When it comes to mixdown summing, the obvious inputs comprise 16 main input channels, plus 16 alternative inputs via the cue bus, plus the four stereo input channels and the two stereo returns. That lot adds up to a total of 44 mixdown inputs. However, the ability to sum the insert returns in the four mix buses adds another eight inputs, to mix an astonishing 52 sources if you really want to! Looking more closely at the 500–series rack reveals that this is actually an entirely separate part of the desk. As described earlier, it comes complete with its own dedicated power supply, and all module inputs and outputs are accessed on separate D–sub connectors. The 500–series slots are primarily intended to facilitate the introduction of EQ or dynamics modules into the channel signal paths via the dedicated ‘500’ insert points, and the desk ships with a set of bridging D–sub links which couple the ‘500’ channel insert sends to the corresponding rack inputs, and the rack outputs back to the corresponding ‘500’ returns. Only the last two 500–series slots are permanently hard-wired into the console’s signal path, as these are dedicated to the pre–installed stereo bus compressor which sits across mix bus A. Of course, the 500–series rack I/O doesn’t have to be wired into the console’s signal paths; it can also be wired up to other external devices, if required — ideally via a patchbay. When installing 500–series mic preamps in the rack, as discussed earlier, the module mic inputs are accessed via the relevant input D–subs. Jumper links are provided (on the backplane, between the module sockets) to allow stereo operation of compressors in adjacent odd/even slot pairs. For convenient plumbing, almost all of the I/O is presented on the rear panel using DB25 D–sub connectors. The main monitor outputs are duplicated on XLRs, and there’s also an XLR talkback input, while the console’s master section provides both a headphone jack output and an unbalanced mini-jack input for quick auditioning from smartphones, MP3 players and so on.I said that only the last two channels were permanently hard-wired into mix bus A, but there are some other hard-wired signal–path options. The last eight rack slots (9–16) can be ‘borrowed’ in pairs, for dedicated internal insert points in the four stereo mix buses. So slots 9/10 can be switched into bus A, 11/12 into bus B, and so on — the idea being to allow 500–series signal processing to be introduced conveniently into the mix buses. These ‘borrowed’ 500–series inserts are positioned in the signal path immediately after the mix bus amp, and are followed by an external insert point. For bus A, the dedicated G–Series stereo bus compressor is the last processor in the chain, just before the bus fader. While the ability to reallocate these 500–series slots to the mix buses is very useful, it would help a lot if the panel below the relevant modules were marked to indicate which modules were routed where — I found myself having to count along the slots each time to make sure I was tweaking the right controls! There is panel space to add some home–made labels, of course, but properly engraved panel legends would be more appropriate on a professional console like this. The idea of four stereo buses came from the film industry, where it’s normal to create stems for dialogue, Foley, effects and music, but it has become popular in music mixing, for grouping instruments according to type, allowing separate bus processing to be applied before these are combined into a stereo mix. In the XL–Desk, each of the four mix–bus sections is equipped with four illuminated lozenge buttons, the first two activating the ‘borrowed’ 500–series slot and external insert point already described. A third, labelled Sum, provides a direct path around the external insert point to allow parallel processing or to introduce additional signals to the mix bus. The fourth button introduces the built–in G–series bus compressor module on Mix A, but for the other three mix buses it routes the bus output back into mix bus A. Mix bus A is equipped with a conventional master fader (driving an MDAC, again), while the other three buses have rotary controls, along with AFL buttons. The stereo cue and aux send master section of the desk provides output level knobs (with +10dB gain in hand) and AFL buttons. The two aux send masters also have buttons to select global pre/post-source selection, while the stereo cue master has a button to route the bus output back into mix bus A. Two stereo returns are also located in the master section, each with an input level control, mono button, pan/balance knob, AFL, and routing buttons for the four mix buses and stereo cue. Although the four stereo mix buses each have their own bar–graph meters (scaled from 0dB at the top to –48dB at the bottom), there’s no facility to meter the channel input levels directly, nor the aux/cue/foldback outputs or AFL signals. Of course, DAWs have channel metering, so it’s not a deal–breaker by any means, but something that might frustrate occasionally! The XL–Desk’s monitoring section provides outputs for ‘main’ and two ‘mini’ sets of monitors, with configurable level offset facilities. The ‘mini 2’ output can also be arranged to work in mono, and a separate mono subwoofer feed features ‘bass management’ crossovers to split the main/mini signal at 80Hz. The monitor outputs pass through 12dB/octave high–pass filters while the subwoofer output uses an 18dB/octave low–pass filter. The console remembers which speaker outputs are being used with the sub, and switches the filters and subwoofer output on/off automatically. Additional monitoring facilities include a mono button and AFL and dim level adjusters, and large illuminated dim and cut buttons are provided. However, there’s no provision for a right-channel polarity–reverse or difference–signal monitoring, sadly. The monitoring source can be selected from the stereo mix A bus, an external rear–panel input, or a front–panel 3.5mm ‘iJack’ socket (for an iPod or similar). A sum button mixes any selected combination of monitor inputs together. Two large talkback buttons are provided, injecting the internal talkback microphone’s signal into two ‘foldback’ outputs. One of these is normally fed from the stereo cue bus, and the other from aux 1, and both have master level control knobs, and push–buttons to replace the cue or aux 1 feeds with the currently selected monitoring section signal. As mentioned, the desk also features a dedicated Listen Mic input, and another large button routes this signal to the monitoring section to allow the engineer to hear what’s going on in the live room. The Listen Mic signal is heavily squashed by SSL’s infamous ‘Listen Mic compressor’, and a direct output is provided for recording. Despite the relatively compact format of this console, it boasts a number of big–console facilities.A front–panel 6.25mm headphone socket has an associated level control, with push buttons to select the foldback A and B outputs (sensibly, these outputs are minus the talkback mic signal). With neither button pressed, the headphone feed defaults to the current monitor selection. The observant will have spotted a curious metal bar running horizontally above channels 11–14, and I had a bit of a ‘D’oh!’ moment when my SSL host picked up his iPad and propped it against the bar, leaning back on the 500–series slots. Of course, a lot of people now use remote control apps on iPads, like Neyrinck’s V–Control, and this arrangement offers a very pragmatic way of providing convenient DAW control without having to build the facilities into the console. Smart! DIP switches on the console’s rear panel configure various options, including setting momentary or latching actions for each talkback switch, and for the talkback signal to replace or mix with the relevant bus signals. Another DIP configures the meters’ peak levels for +24dBu or +18dBu, while several more are for ‘reserved functions’. Sitting in front of the console, everything falls easily to hand, and when loaded with 16 E–series EQ modules it looks and feels like a small but high–quality SSL console. I imagine this classic SSL styling suffers somewhat if the 500–series rack is stuffed with an eclectic collection of third–party modules, but that approach has its plus points too. The desk sections are angled for ease of reach.Though I’m not a great fan of processing while tracking, I often high–pass-filter sources to keep some control over unwanted low-frequency muddiness — but unfortunately neither the VHD preamps nor the E–series EQ modules include high–pass filters. Of course, this filtering can be done easily post–recording in the DAW, and post–preamp filters could be inserted courtesy of third–party 500–series modules, but some might find the omission of HPFs frustrating. The XL–Desk is a very simple (dumb) yet versatile (smart) console, but the real flexibility comes when it is installed with a full patchbay to provide more flexible access to the individual 500–series modules, 42 insert points, direct outputs and so on. It also opens the intriguing possibility of creating a hybrid console, combining 500-series modules from Neve and API (I’m told other brands are available!) to allow the oft-cited ‘perfect’ solution of tracking through Neve 1073 or API 512C preamps, before mixing or summing via the SSL SuperAnalogue infrastructure. That’s an appealing concept, certainly, although all those additional preamps wouldn’t come cheap! I think the XL–Desk is very well designed and targeted towards studios involved in small–scale tracking and overdubbing, with summing–box–style mixdowns from automated DAW tracks and stems. The ability to record individual console mix stems back into the DAW for archiving is also very appealing. The XL–Desk neatly fills the gap between the small and limited X–Desk, and the much more feature–laden and expensive Matrix 2 and AWS consoles. Naturally, it won’t suit anyone wanting integrated DAW control or fader automation, but that still leaves a very sizeable market, and at least there’s somewhere to prop up an iPad running a remote–control app! Looking to the future, SSL clearly have development plans for the XL–Desk, even if they’re keeping things tightly under wraps at the moment. Some of the console’s signal switching appears to be overseen by an internal microcontroller of some kind (hence the USB provision for firmware upgrades), the faders operate MDACs, and there are those mysteriously labelled D–subs on the back panel too. It doesn’t seem too extreme to imagine that there may be potential already built into this desk for some level of useful integration with DAWs in a future update — even if only mute automation or remote MDAC control (like the Sigma). There’s obviously also some provision for a possible expander unit to increase the channel counts... However, when I mused along these lines the SSL gurus just smiled knowingly, so we’ll have to wait and see. Regardless of what happens in the future, the XL–Desk is already a very impressive console, in terms of what it can do, what it costs, and how it sounds. It should have a great future. There are several consoles that offer 500–series slot options in various formats and channel counts. For example, the Ocean Audio Ark provides two 500–series slots per channel, six auxes, eight buses and a stereo master. The Inward Connections Tree 500 console provides three 500–series slots per channel, with four auxes plus a stereo cue, four mix buses and a stereo master. API’s The Box console provides four mic preamps with two 500–series slots, plus 16 summing channels, with two mono and two stereo aux/cue sends. Purple Audio, AwTac, Tonelux and Pete’s Place Audio are among the generous handful of others who offer consoles based on the 500–series format. MDAC is an acronym for ‘Multiplying Digital to Analogue Converter’, a unique technology which SSL introduced with the Duality console. Despite the name, the audio signal path is entirely analogue, but it’s governed by a digital control signal that’s derived from the fader (or an external data signal). You can think of the MDAC as a kind of voltage–controlled amplifier or VCA (although strictly, it is a DCA). In a conventional D–A converter, a digital audio sample describes the required amplitude of the output voltage corresponding to a specific moment in time, and the D–A converter essentially attenuates a peak–level reference DC voltage to deliver the required output voltage for each sample — thus producing the varying analogue audio output. The MDAC system works in a similar way — the channel’s analogue audio signal effectively becomes the ‘reference’ instead of a fixed voltage. However, the digital control data still instructs the DAC to attenuate the signal by the required amount, so the audio signal itself remains entirely in the analogue domain. The benefit of the MDAC approach is that it provides excellent distortion and noise performance, while attenuation settings can be recalled precisely, and are easily controlled from a DAW or other remote device. Huge 44/52 input count for summing. Freely accessible 16-slot 500–series rack. Clever 500–series module internal routing options. Built–in G–series stereo bus compressor (with side–chain high-pass filter). 42 channel and mix-bus balanced inserts. Direct outputs on all channels and mix buses. Pragmatic aux/cue and talkback facilities. Intriguing possibilities for future upgrades/expansion. Potential for low–level fan noise. Lack of labelling on ‘borrowed’ 500 slots. No direct metering of channel PFL or AFL signals. Additional expense involved in installation cabling/patchbay and filling 500–series slots. The XL–Desk sits neatly between the diminutive and basic X–Desk and the far more complex Matrix 2 and AWS consoles. With 24 input channels, eight mic preamps, 44 mixdown inputs and four stereo mix buses, this is a much larger desk than its footprint suggests. Although it omits DAW control integration and fader automation, it does incorporate a 16–slot 500–series rack, and provides very comprehensive I/O connectivity. £11,750 (unloaded), £15,500 (with eight SSL E–series EQ modules), or £18,750 (16 EQ modules). Prices exclude VAT. $19,999 (unloaded), $27,000 (with eight SSL E–series EQ modules), or $32,999 (16 EQ modules).